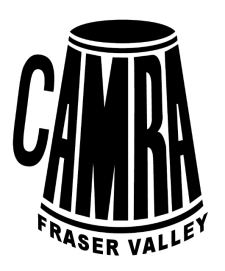 FRASER VALLEY, BC – Further cementing its place as one of the largest and most active craft beer advocacy groups in North America, CAMRA BC has launched a CAMRA Fraser Valley, a new branch that joins those previously established in Vancouver, Victoria and Penticton. Not a lot of information has been announced about the new branch, with its website just featuring the branch logo. But as with the other BC branches, CAMRA Fraser Valley will have a broader mandate than the original CAMRA UK movement, and will support craft beer in general rather than focussing specifically on cask or real ale. Those interested in finding out more about CAMRA Fraser Valley can contact and follow the group via its Twitter page. It is a much needed addition, as CAMRA Vancouver, now at over 400 members, planned most events within the Vancouver/Surrey limits, making it a challenge for those that live out side the boundaries to attend. Of course, we in Vancouver were challenged to get out to the suburbs as well! I chose a few people that I thought would be good at getting the ball rolling, and we already had a corporate sponsor in Maple Ridge that was eager to help.